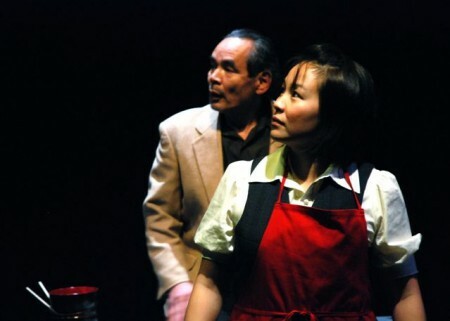 Maiko Bae Yamamoto and James Long are two of the most promising theatre artists in Canada. In February 2009, Theatre Replacement was awarded the prestigious Rio Tinto Alcan Performing Arts Award for Theatre. The $60,000 award will allow Yamamoto and Long, alumni of Boca Del Lupo, to produce The Greatest Cities in the World, a show that promises to be radical, engaging and inventive. Recently, I was witness to the company’s sincere commitment to creative exploration at the Gateway Theatre, where I attended Train, a quiet and thoughtful piece written by and starring Yamamoto. The piece premiered as part of Alberta Theatre Projects’ Enbridge playRites Festival in Calgary and has since been performed in British Columbia. Having come full circle, the show’s most recent run took place in Richmond, B.C. Ironic, since Yamamoto remembers this place fondly from her childhood. Yamamoto proudly visited Richmond, where her father, Minoru Kofu Yamamoto, was inexplicably famous; in Richmond, a park, aquatic centre and boulevard are all named Minoru. In actuality, Yamamoto learned, these locations are named after King Edward VII’s Epsom Derby-winning Irish thoroughbred racehorse, Minoru. Accordingly, the indistinct boundary between truth and imagination figures largely in Yamamoto’s work. Train dances between fact and fiction ambiguously, seamlessly transporting the audience beyond the “black-box” theatre by way of captivating chronicles. Train is the story of a man who waits at a non-descript Tokyo train station, while a woman walks up and down alongside the tracks; there is also a young noodle-stand girl who witnesses actions as they unfold. This story is complemented by a fable about a celestial maiden and a fisherman, song, shakuhachi flute performances by the elder Yamamoto, and poetic movement. All of these aspects were interwoven and layered in order to tell a simple but evocative family story. I asked Maiko Yamamoto to describe her work as a theatre artist, and specifically Train, its inspirations, sources, creation, and evolution. (Ricepaper) RP: What was the context for the creation of Train and what were your goals in the production of the piece? (Maiko Bae Yamamoto) MBY: Well, it’s a piece I’ve been working on for a really long time. Around 1998, I started to think about recording family stories because we’re all adults now and my parents are getting older. There were all of these stories and I wanted to record and remember them. I started writing them down: things that my parents had told me, things I had learned from visiting my grandparents back in Japan, or stories that aunts and uncles had told me. These stories became the basis of Train. One story that I heard as a kid haunted me, and I kept thinking about it, over and over again. The play to me is definitely a ghost story, about ghosts real and imagined. For instance, the story of the celestial maiden and the fisherman fable is parallel to my mother and father’s story in Train. One of the narrative threads in the piece suggests that my mother and father were part of a Romeo-and-Juliet story. In reality, they were forbidden from getting married by my grandfather, who is a “real” ghost in the story. In a way, I feel as if his energy haunts my family. A lot of imagined ghosts arose when I was writing it, as well. While working with different collaborators, the piece blew up into this play that blurred the line between fiction and reality. I was lucky enough to do a residency with Rumble Productions when Norman Armour (current director of the PuSh International Performing Arts Festival) was the artistic director. As part of my residency, he said to me, “We’re going to work on a piece of yours.” During this residency I worked with dramaturg Rachel Ditor. The play really started to take its shape when I started to work with another dramaturg at Alberta Theatre Projects, where I was invited to join their playRites’ colony. RP: What’s the difference between performing text that you’ve written for yourself and performing something that was written by someone else? MBY: There’s definitely a different level of involvement when I’m working on a piece that is my own, as opposed to working as a hired actor. I feel that there’s more of my emotional heart left on the stage at the end of a piece like Train, as opposed to performing something like The Cherry Orchard. I want everything to be right. And because it’s a tribute to my family, there’s another level of stress and anxiety. When I perform someone else’s work, it’s my job to interpret the text and make it come to life in the best way I can. But unlike my own work, I don’t have to rewrite anything. I like both of those experiences immensely. It’s an invaluable lesson for actors to work with different people, on different projects. In our company, we also encourage that. We make sure that both James Long, (Artistic co-director of Theatre Replacement) and I get time to freelance so that we’re learning new things and bringing them back to the company. RP: The mandate of Theatre Replacement is to explore contemporary existence and identity. How did you approach these themes in this play? MBY: It just means that things take place in a contemporary time frame. When you see our works, they should show life everyday as you see it on the street. So we don’t perform or create period pieces; we always create new work. With Train, there are a lot of stories about the past as well as a mythical part with the celestial maiden, but in the end, it’s really told from a contemporary point of view. RP: I noticed right away that the play speaks to a global audience. At the start of Train, you say, “Imagine that you’re in a typical train station in Tokyo,” which supposes that the audience knows what that would look like. MBY: Yes, and if they don’t know what that looks like, they can imagine their own train station so they can get St. Petersburg mixed with Tokyo. It’s really great. The audience’s imaginations are such a big part of the play.